Grace is a girl who loves stories and enjoyed acting them out. She had a great personality for exploration and could make anything ordinary seem extraordinary. But most of all Grace loved to act out stories and fairy tales. So when her teacher shared with the class that they would be performing the show Peter Pan, Grace knew exactly who she wanted to be! Grace's classmates did not agree with Grace's decision on wanting to be Peter Pan. They said things like"that's a boy's name" and "he isn't black", but this would not stop Grace from playing a role she wanted to play! Element 4 asks teachers to share stories of everyday people standing up to address the issues of social injustice and that ordinary people can make a change. Amazing Grace teaches us just that, as Grace is able to make a change and show her classmates that a black girl can too play the role of Peter Pan. It is so important for students to understand that not only is it okay to be different but also that being different does not stop you from doing what you believe in. Grace teaches us that instead of feeling overwhelmed or defeated about discrimination, we should address the issue and show people that a change can be made! 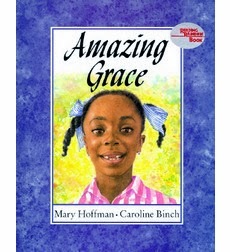 There are so many ways to incorporate Grace's story in a classroom setting. It is important to remember to take in to consideration your classroom and your students. The classroom environment needs to be able to support a topic like discrimination but also understand that like Grace taught us, there has been and will continue to be a change and a time to stand up for what you believe in. *Students can write letters to Grace about her decision to stand up and make a change. Topics can range from asking her about how it made her feel when students discriminated against her, what made her create a social change in her classroom, or how did she feel when she was able to speak up for what she believed in. *Students can create their own social movement. A discussion must be had about something the class does not believe is fair and relevant to their society (short recess, no free lunch, etc.) From there, the class can brainstorm ways to create a social movement and stand up for what they believe in!